The copyrights for all the information given and photos depicted, remains with the original authors and www.Marineflieger.de! Click on to the FLY NAVY logo to visit this great website! The first prototype of the chosen P.200 was presented to the public at Manching on 8th april 1974. It's maiden flight followed half a year later on 14th august. The arrival of the second prototype at Warton/GB also meant the renaming of the programme into "Tornado". Between 1974 and 1979 extensive tests were conducted with a total of 16 pre-production aircraft, of which six were build by MBB and BAe each, and another four by FIAT. In the meantime, German officials had to drastically reduce their order of originally 700 aircraft to 324 examples, of which 112 were bound for the german navy. 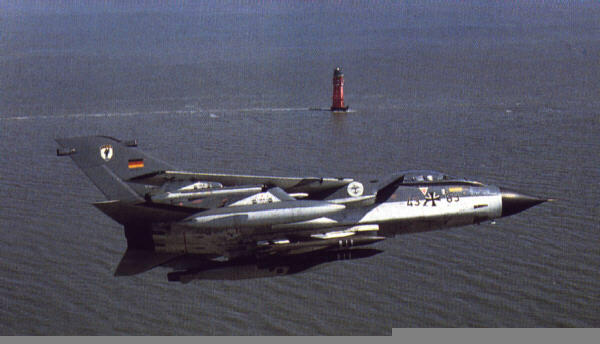 This meant, the Tornado would only replace the F-104G Starfighter in both Navy and Air Force. 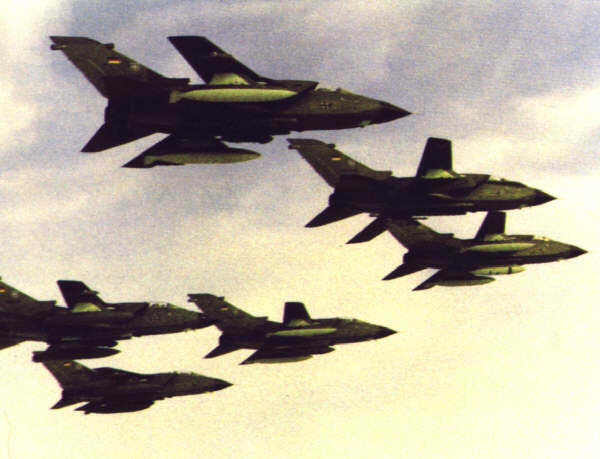 In may 1979 the newly formed Tornado training wing - the TTTE (Trinational Tornado Training Establishment), based in Cottesmore/GB began to train crews from the three partner countries. The needed aircraft were drawn from Germany, Great Britain and Italy and would have formed individual fighter bomber wings for those respective countries in the case of war. The first production aircraft were delivered to TTTE in 1980. MFG 1 had the honours to be the first Bundeswehr unit to be equipped with the multirole aircraft, as they started conversion in 1982. It took approximately one year until all of the 48 Tornados were received. Navy crews were delighted with the performance of the newly acquired aircraft, as the Starfighter had never been the Navy's choice. 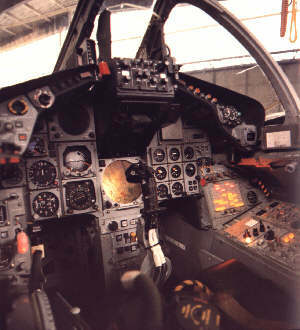 The Tornado marked a vast improvement in respects of weaponsload, avionics, navigational aids and accuracy, range and safety. Accuracy of the internal navigation system was also proved, when two Navy Tornados flew to the Azores, relying solely on their own navigational aids. on arrival there had been a deviation of only a few meters. 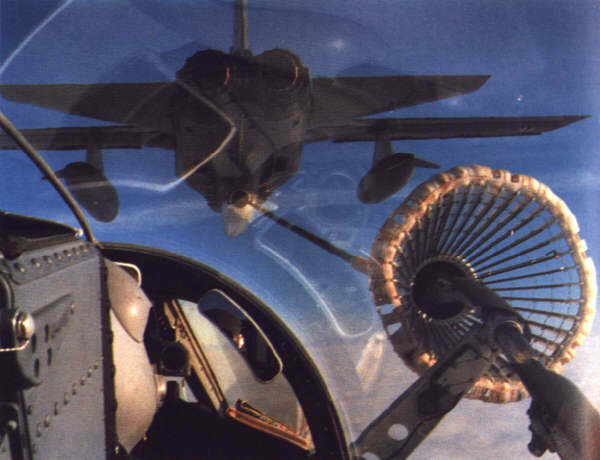 Another improtant fact was the ability of buddy-buddy refueling, thus enabling the Navy to extend their flying routes enormously compared to the F-104G. in addition, the two crew concept meant a relieve of workload for the pilot and the mission profiles could be adjusted accordingly. 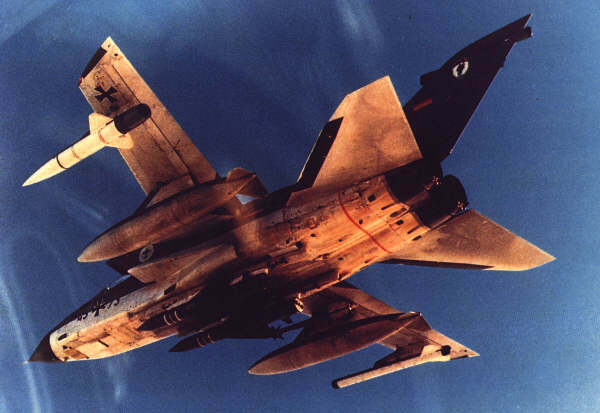 In september 1986 MFG 2 finally started to convert to the Tornado weaponssystem. Had MFG 1 still received Block 2 aircraft, MFG 2 introduced the newer and modified Block 5 airframes. 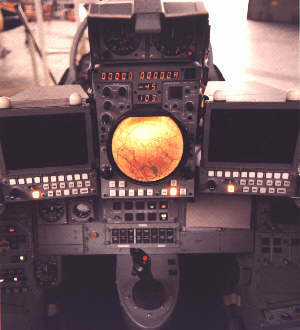 Probably the major adjustment (next to updated avioncs and computers) was the incorporation of the HARM (Highspeed Anti Radar Missile). Therefore, even long before the introduction of the dedicated Tornado ECR into Luftwaffe service, MFG 2 had the ability to fight enemy Radar installations. After the reunification and with a disappearing threat from the east, the german armed forces had to reduce costs drastically. Amongst others, MFG 1 was one of the units to be disestablished. This took place on 31st december 1993. Of the originally 48 aircraft on strength, 10 were handed over to MFG 2, whilst the remaining aircraft were transferred to the re-established AG (recce-wing) 51, which also took over Jagel airbase. The 10 surplus Tornados now form a third squadron within MFG 2, who's task is the training an europeanization of Navy aircrews. Europeanization became neccessary, as the TTTE was disestablished in 1999, with german crews now training at Holloman AFB /USA. 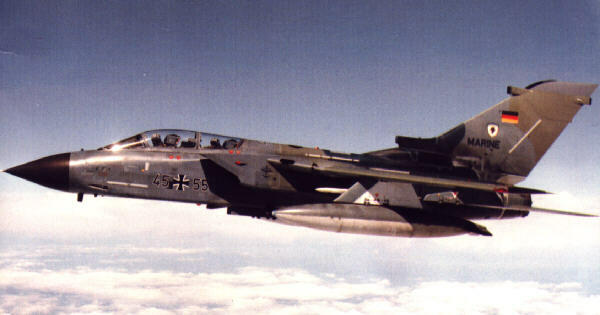 Though it's maiden flight lies 25 years in the past, Tornado still forms the backbone of the Bundeswehrs attack and recce airwings and a successor is not yet in sight. Still a large modernization programme will take place in the near future, equipping the Tornado with FLIR, a new GPS, modified ECM equipment and avionics. Modificatzions are planned to be finished by 2004.